Coastal lighting to give your space the perfect ambiance. Lighting can be the focus of a room. Make your chandelier powerful enough and it becomes a work of art in your space. Every room needs a combination of general lighting, task lighting and accent lighting to set a mood and provide sufficient illumination. Table and floor lamps, which typically fall under the task lighting category, are especially important because they play both a functional and decorative role in your home. Determine what your lighting goals are. Direct or task lighting is focused in the space you are trying to work. Ambient or indirect lighting is used for ambiance and for overall lighting of a space. Each room should have a mood you want to set, as well as a function you want your lighting to serve.Use multiple light sources for one space, for rooms like the kitchen, bedrooms, and living spaces, multiple light sources will help you achieve a variety of functions and activities in that space. In the kitchen, under counter lights can provide great task lighting. While in a living room a floor lamp next to a couch or favorite reading chair serves a great purpose. Use exterior wall sconces for décor. Wall sconces can provide washes of light against the exterior walls of your home to create ambiance in the evening hours. Directional sconces pointing upwards or downwards can focus on architectural elements on your home, and draw attention to landscaping around your home. In spaces that a chandelier is considered, choose one that will not date your space. Whichever is your décor choice, measure out the space, and ceiling height before ordering to ensure enough head room will be available below the hanging chandelier. Nautical style lighting that is creative and inspiring. Coastal lighting for all your beach house needs. Nautical rope and glass ball chandelier over 4 poster bed. 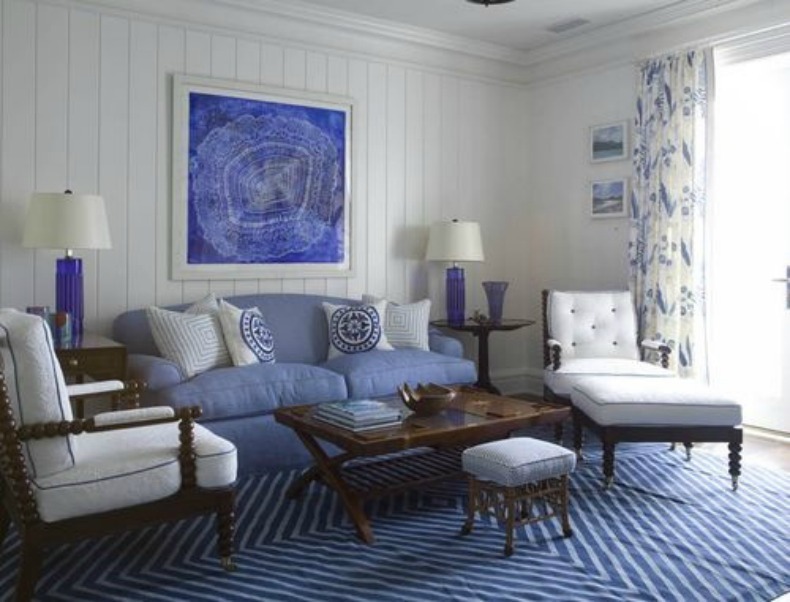 Hanging lanterns in Living Room with light blue striped chair & white sofas. 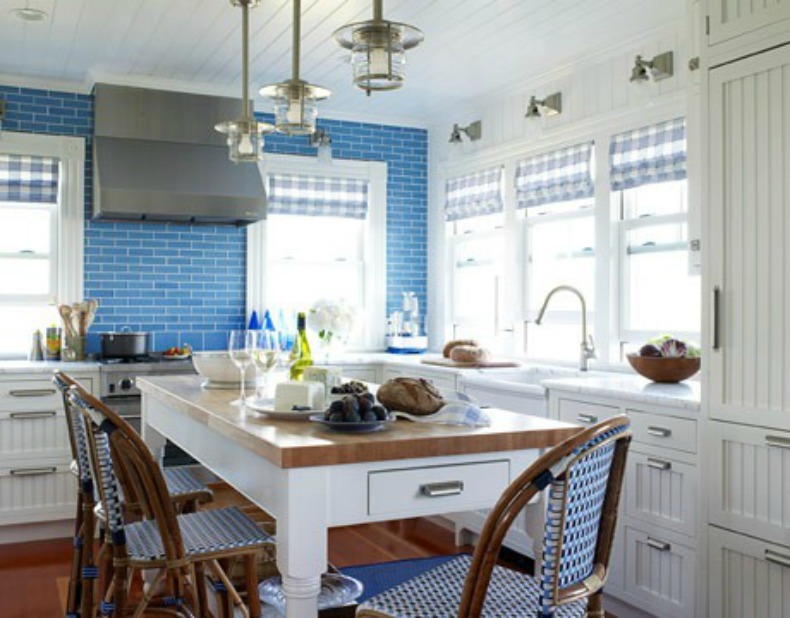 Ship light pendants over blue and white Kitchen. Blue glass lamps in blue and white Living Room. 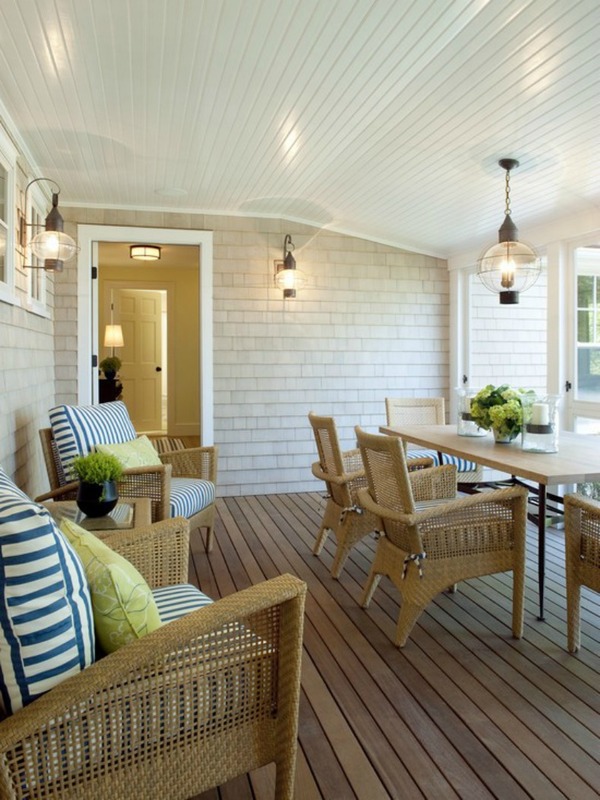 Nautical outdoor sconces in Lanai with wicker furniture. Wood & iron chandeliers in large white wood room.